From a 2007 meeting of friends sharing some pizza boxes at a Youthline building, the group formed with the support of the Youthline Trust. The Collective has grown into a diverse group of poets, singers, musicians, writers and performers. Last year they released a book and DVD of their work with the support of Creative New Zealand. 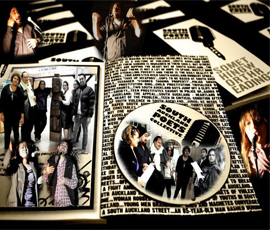 South Auckland Poets Collective brings to voice the urban Pacific and Maori experience, using the power of poetry and spoken word to inspire, create and educate. It’s street poetry in the Def Jam style, telling stories of their own lives. Armed with their voices and notebooks, they defy the negative stereotypes of Maori and Pacific youth in Manukau and substitute a new story – of a group of young people, gifted and brown, brought together by their love of poetry. Zane Scarborough – A father. A husband. A poet. A youth-worker of sorts. A member of the South Auckland Poets Collective. a loud mouth. a believer in God. Zanes poetry is clever, witty, heart-felt and always captivating, he writes about life experiences, his wife, his son and highschool. Clara Jane Sione – A lover of the arts, based in Otara, she refers to her poetry as mental notes learning how to speak. she writes of imagination, her life in south auckland and her family. Dietrich Solokai – A Youth worker, who lives in Manukau. Poetry always written with the intent to thought prevoke listeners. Dietrich has written pieces about Faith, finding love and the want to ‘Sky Dive’ through life. Marina Alefosio – A musician and mother of two from Manurewa, her poetry touches on common misconceptions of relationships and love. “If its love that we are seeking, it should be love that we are seeking’.